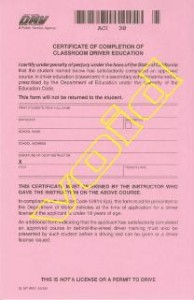 The student will then take the written test to obtain the permit at the DMV. 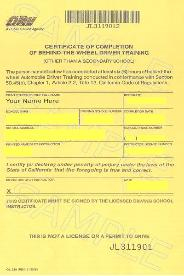 You will need to provide a Birth Certificate, (original from the county you were born in), Social Security Card, Driver’s Education Completion form as described above, DL 44 (application signed by Parent(s) or Guardian, student will wait to sign at the DMV and an application fee of $31 payable to the DMV. When you pass the written test, the DMV will issue you your provisional instruction permit. THIS IS NOT VALID UNTIL AFTER YOUR FIRST LESSON WITH A DRIVING INSTRUCTOR! To schedule your first lesson, call our office at 209-485-3699 with your permit number, issue date, and expiration date. 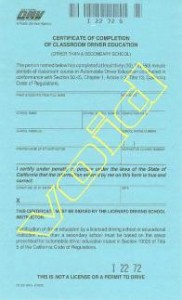 The first lesson is scheduled after the permit is obtained. (Gold). This certificate is issued to the student by the instructor on their last lesson with our school. In addition to the required 6 hours with a driving school, the State of California also requires teens to have 50 hours of driving (10 of the 50 hours at night) with a parent or licensed driver over the age of 25.